MTM has tuned an Audi Q3 crossover and Volkswagen T 500 van for the Geneva Motor Show. Tuning companies always try to make the biggest impact possible at the Geneva Motor Show and MTM from Germany is no different. The tuners have prepared two German flag-wrapped models for the show, the first being an Audi Q3 crossover and the second being a Volkswagen T 500 van. Based on the Audi Q3 crossover with the S-Line package, MTM&apos;s aftermarket program boosts power significantly and improves performance greatly. It runs on a 2.0-liter TFSI Quattro engine with power boosted by the tuners from 170hp to 310hp. The added power cuts 0-62mph time by a solid two seconds, as it can now accomplish the sprint in 6.1 seconds. Top speed has been boosted as well, from 132hp to 155mph. The performance upgrades for the Audi Q3 come thanks to the use of a turbocharging kit, unique exhaust system and rear diffuser. Having been lowered, the Q3 sits on a set of 20-inch MTM Bimoto wheels completes the tuning package for the Q3. MTM&apos;s second offering comes in the form of Volkswagen&apos;s T500 van. Running on a 2.5-liter inline-five TFSI 4motion engine rated now at 472hp and 461 lb-ft of torque, it can "roar off into the distance." The van is now capable of reaching a top speed of 174mph, up from its original 124mph. The van features a KW Street Comfort coilover suspension and sits on a set of 20-inch MTM Bimoto wheels wrapped in Michelin SuperSport rubbers. 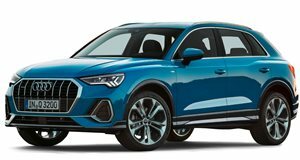 The Audi Q3 by MTM prices just shy of €59,000 compared to €37,000 with the S-Line package. The MTM VW T 500 van has yet to have its pricing released. They will both be on display at MTM&apos;s booth at the 2012 Geneva Motor Show, kicking off on March 6th.